A powered stair climber provides a quick, safe and efficient material handling solution for transportation on the stairs. With a carrying capacity of up to 150Kg, the Sprinter 150 stair climber trolley will allow you to manoeuvre awkward loads up and downstairs with just a single operator. Meaning that not only are there huge labour cost savings to be made, but the lightweight machine can significantly reduce the potential risk of personal injury and expensive litigation claims. The stair climber adheres to strict H&S guidelines and EC handling regulations, so you can rest assured that your business is operating compliantly. And you will receive further peace of mind knowing that the machine is covered by our 12-month warranty. With a wide range of accessories available, each powered stair climber can be fully customisable to your business giving you a fast ROI. The puncture proof tyres, simple touch button control and rechargeable battery with monitor are just a few of the features which make the Sprinter 150 a market leading powered stair climbing trolley. Power your way with hire or buy. Hire a Sprinter 150 then make a purchase or simply return the trolley back after the agreed period. We offer several finance plans as well. Contact us to discuss which option is suitable for you. Terms and conditions apply. Speak to us to find out more. 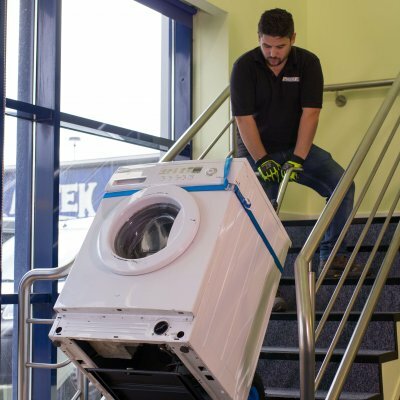 Moving white goods up or down a set of stairs is not a straightforward task, particularly when the product to be transported is a bulky item such as a washing machine. As a business, you have a duty of care to your workforce. By using the Sprinter 150 stair climber you will be complying to the requirements expected of you as an employer. 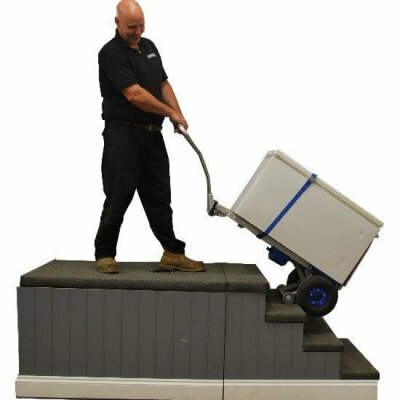 A powered stair climber is a simple cost-effective solution which allows the operator to move a washing machine safely and efficiently. The Sprinter 150 enables white goods, such as a washing machine, to be delivered by a single worker in a safe, controlled environment. The risk of personal injury is removed, significantly reducing the likeliness of litigation claims against a business and the resulting bad press associated with such claims. The innovative trolley gives the operator greater control over the movement of the washing machine reducing the potential damage to the product and the place of delivery whilst displaying professionalism to your customer. Contact our sales team to find out how the Sprinter 150 can help your business become more efficient and compliant.